RAID data recovery carries a special set of challenges. Designed to provide redundancy, a RAID system will continue functioning even if its hard drive fails. Performance is negatively affected, of course, when the RAID array continues to operate in this compromised “degraded” or “critical” state: the data stored on the entire array is in danger of being corrupted or rendered inaccessible. Lost data will have to be regenerated from the parity data – a laborious and painstaking operation at best, and the rebuilding process may involve the reinstallation of data on not just one but every hard drive involved with the system. The higher the RAID level, the more complex the rebuilding process can become. Fortunately there are a number of reputable data recovery services that specialize in RAID data recovery, software packages that allow intrepid computer users to undertake the recovery themselves, and even detailed sets of instructions for those who think they have what it takes to recover their data entirely on their own. Each data storage scheme — called RAID 0, RAID 1, RAID 2 etc. — uses one or more of these techniques depending upon system requirements. Though the data is distributed across multiple disks, the operating system and the end user see the array as a single disc. 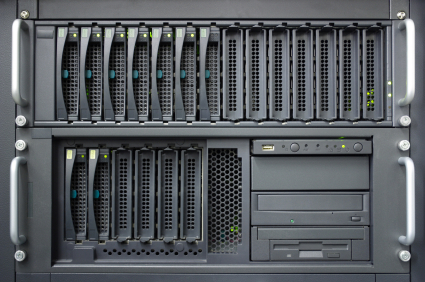 RAID systems were originally designed to handle huge volumes of data for companies, corporations and other organizations that needed access to their data every moment of the day, with no interruption to, or impact upon, business operations: Redundancy, it was thought, would maximize uptime. RAID is not a backup method in and of itself; RAID drives are as susceptible as any other storage solution to data corruption and loss. Many organizations using RAID systems are not rigorous about backing up their data since the costs of backing up the individual discs in a RAID set-up frequently outweigh the savings associated with RAID systems in the first place. Thus when problems do arise, data recovery services are often their very first intervention. RAID data recovery services target two types of damage. Logical damage occurs when the pattern of data on a disc doesn’t match the computer’s expectations of what it should be, causing difficulties in reading and handling the data. This can occur secondary to a power interruption, a virus infection, a user error or anything else that interrupts the process of encoding data, and generally demands a solution in which a software program is used to analyze the corrupted data and figure out how it should be rearranged in order to make sense once again. Physical damage, on the other hand — as its name implies — occurs when the hard drives making up the RAID system are injured in some way. Recovery techniques under these circumstances are a two-fold purpose that first utilize a special software program to collect all of the data remaining on the drive and compile it into a disc image, and then replace the damaged disc surface so that the drive will be readable once again. The cost for RAID Data Recovery services is highly variable: cost will depend upon how widespread the damage is and how much work will be necessary in order to rebuild the data. Your best bet will be to choose a company that offers to assess the cost of repair for free and negotiate from there. Pricing generally starts at $500. Non-cleanroom, in-lab data recovery can be anywhere from $2000 upwards, while online data recovery options start at $3000. ESS has facilities in Minnesota, Illinois, California, and Ontario Canada. They begin the data recovery process by creating duplicate back-up images of each drive before beginning the reconstruction process itself. After your data is recovered, it is cloned, copied on to an external drive or some other form of media and overnighted to you. The clone is kept on ESS premises until it has been determined that no further problems exist, and then it is destroyed using Department of Defense security standards. Your are assigned a single ESS point person at the beginning of your interactions with the company, and that person remains your representative throughout. Satisfied customers include NASA, Brookhaven National Labs and the Mayo Clinic. Datatech Labs has a single facility in Edwardsville, IL. The company promises it can recover data from any type of RAID and any type of failure, and it particularly prides itself on the ability to recover data from crashed arrays where other companies have failed. Datatech Labs offers a “No Charge Evaluation” and will give you a range of recovery fees over the phone that are contingent upon how extensive you want your data recovery to be. Satisfied clients include the US Department of the Interior, NOAA Aircraft Operations, and SHOCO Oil Inc. Rapid Recovery Online specializes in remote (i.e. online) RAID recovery services, and boasts a success rate of 97% since 1986. The Internet link is fully encrypted and secured by a 256-bit SSL connection. At the end of their initial diagnostic procedure, customers are given a list of all the files and folders that can be recovered, with the option to choose some or all of them. Payment can be transacted through PayPal as well as credit cards. Satisfied customers include the Channel Two News Company, Dell Israel, and IBM Israel. If you are looking at a relatively small problem or for some other reason prefer not to outsource your damaged RAID drives to a third person company, you can always undertake the repairs yourself with the help with the help of a RAID data recovery software solution. Quick Recovery RAID ($794) from the Indian company Unistal Systems Pvt Ltd is a well-regarded RAID recovery solution for the Windows platform that promises to recover data in the aftermath of file deletion, array format, partition table related corruption, FAT corruption, MFT corruption and other malfunctions. Unistal Systems Pvt. Ltd also offers a less expensive software solution called Quick Recovery for RAID ($118). Runtime Software offers RAID Reconstructor V4.00 ($99) which allows you to recover data from a broken RAID Level 5 or 0 Array and comes with a 30 day free trial. Additionally, there are data recovery software packages that contain a RAID option alongside other data recovery solutions. These include DT Utilities Digital Rescue Premium (Publisher: Data Transfer,$49.95), and Recover My Files (Publisher: GetData, $69.95, and Data Recovery Wizard 5.0.1 (Publisher: Easeus, $69.95).